Her name alone carries with a deep meaning: one whose soul does not age. Her face beams with pride and passion while she tells the story of her people. Shirley Djukurnã is a strong woman, proud of her origins. 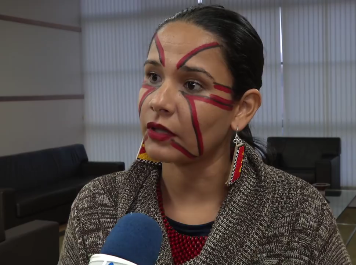 Shirley Djukurnã, a graduate in Social Communication, Advertising and Campaigning, has made it her life’s work to fight for the rights of the indigenous peoples of Brazil, and preserve their heritage. 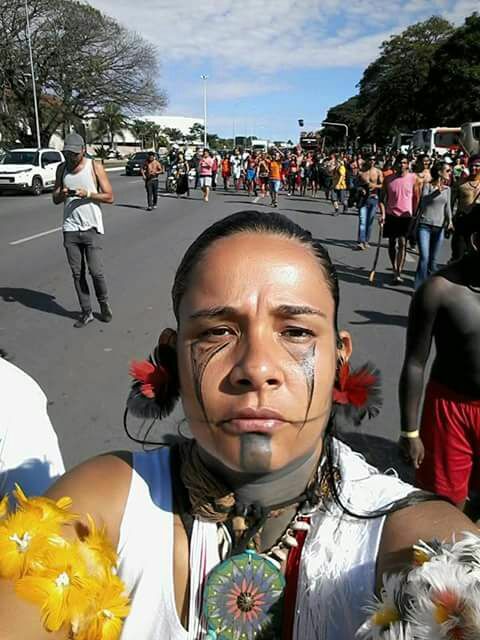 Her prerogative is to safeguard the language, culture and traditions of her tribe – the Krenak – a people once declared extinct, but who have reappeared to demonstrate the strength, development and wealth of tradition belonging to the Brazilian indigenous community. “My people are known as the Botocudos from the Doce River valley” explained Shirley a few months ago at a conference at the University of Turin in Italy. “Just like almost all of the indigenous peoples of South America, they suffered the raids of European colonizers; we were 30,000 strong when the Portuguese arrived in the 17th century, now there are only 600 of us left. The suffering does not end there. The environmental disasters, and land and water grabbing happening of late, are new forms of oppression that my people are forced to endure”. It was the Doce River disaster in 2015 that rang alarm bells for the survival of the Krenak. For the indigenous community, the river is sacred: it is not only a fundamental source of life but also an important place for rituals. This is why the Krenak – led by Shirley and other activists – have been fighting for years to prevent other similar environmental disasters and to ensure that the community can live safely on its own land, using and managing the resources that the government should be providing. “I cannot stress enough how important it is for people to understand that environmental disasters, such as the Bento Rodrigues dam disaster, do not concern just indigenous peoples” Shirley explained. “The so-called “progress” that is destroying forests, ruining land or polluting and privatizing water, can be seen in places all over the world. How can we call it progress when it is destroying our planet? I am not scared by the threats that I receive every day. I will not stop. On the contrary, I will push harder, and call for others to join us. The indigenous population is trying to change things, but it is not the fight of indigenous peoples alone. The Doce River valley is as important as any other water source or forest in the world. We all share the same planet, we are more connected than we appreciate”. Even though our scared river faces its doom, we are sure we can revive it. Mother Earth’s blood continues to run through other small rivers in the area. We can still revive and preserve our food, culture and traditions. Let us join forces to make it happen. Together we can. Shirley Djukurnã and other indigenous leaders were in Italy during the international week for the elimination of racial discrimination, an initiative organized by the Turin network for indigenous peoples, driven by Anna Conti.